As with any software, you can get the most out of Safari web browser when you’re familiar with the tools it offers. Here’s where to find each tool and give you a general idea of each tool’s purpose. Back: Takes you to the previous web page (unless this is your first stop); click again to go back another page, and so on, until you wind up on the first page you viewed when you launched Safari. Forward: Moves you forward to a page you backed away from; click again to advance to the next page you backed away from, and so on, until you wind up on the last page you visited before you clicked the Back button. Home: Click Home to return to the web page that opens when you open Safari. iCloud: Opens iCloud Tabs, which shows the websites that are open in Safari on your other iOS devices. Share: Use this tool to easily grab the link to the page you’re reading and send it to someone else or save it as a bookmark or on Reading List. Add: Open a new tab. Search and Address: Type a web address here or enter a search term. Sidebar: In the Sidebar pane, see your bookmarks, Reading List, and Shared Links..
Top Sites: Your Mac keeps track of which sites you visit most frequently and helps you quickly return to them. 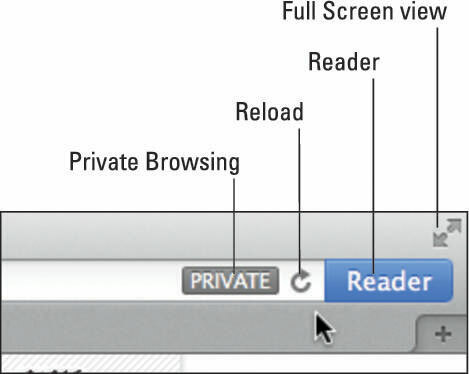 Private Browsing: While this option is selected, Safari forgets your browsing history when you leave Safari. This is a good choice if you want to keep your online shopping secret from curious eyes that might use and see your computer before the holidays. Reload: Clicking the little arrowed-circle icon on the right side of the address bar reloads the current web page and displays any new information that changed since you arrived on the web page (such as breaking news on The New York Times home page). When Safari is loading or reloading a web page, the arrowed-circle turns into an X icon. Clicking the X icon stops Safari from loading or reloading the web page. Reader: If the Reader option is available, as explained in the section “Reading in Reader,” clicking this button will open the text in Reader. Full Screen view: Safari supports full-screen view. Click the Full Screen button in the upper-right corner to take advantage of your entire screen. To return to partial-screen view, press the Esc button or hover the pointer in the upper-right corner until you see the Full Screen View toggle switch and then click it once. If Safari looks different on your Mac than these figures, you probably have different options selected for the Toolbar (or are using a different version, in which case, upgrade and then return here). To add or delete the buttons on the Safari Toolbar, choose View→Customize Toolbar. A pane opens, as shown. 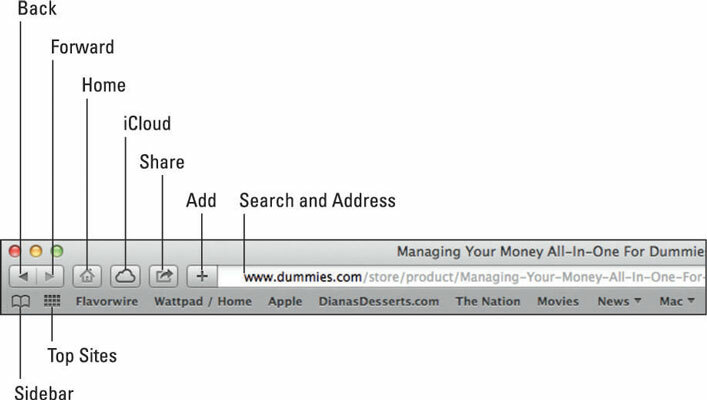 Click and drag the icons to and from the toolbar and the pane to create a toolbar that meets your browsing needs.